Interspan Global Logistics Limited provides time-sensitive, door-to-door / door-to airport air freight services, collecting freight from any given location within the United Kingdom and delivering it globally to airport or direct to your customer. We have preferential agreed rates with most established and globally known airlines, and we can arrange both Consolidated Airfreight to keep costs down and back to back shipments for the more urgent consignments. All shipments booked can be individually tracked to give our customers a simple and worry free experience. 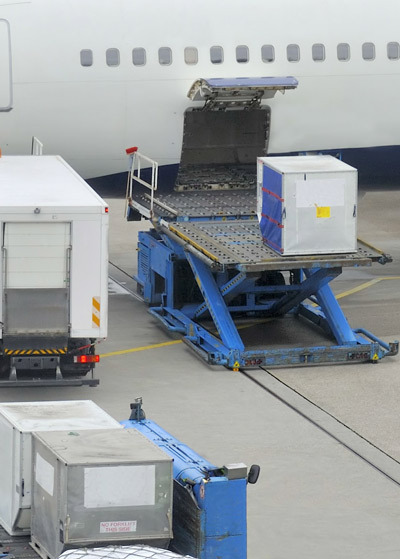 Dangerous goods can also be catered for subject to hazard acceptance, we can arrange IATA Dangerous goods paperwork and have the facilities to get all hazardous cargo checked to ensure it is suitably packed in accordance with IATA PAX regulations for airfreight. We have a vast knowledge of overseas markets and country importation regulations, so we have the ability to ensure documentary requirements are catered for, when required. Interspan offer total logistics for smaller consignments with extremely competitive global courier Services, including overseas documentation courier services. We have accounts with most major couriers including DHL, Fedex and UPS. As well as providing air exports services, Interspan Global Logistics can also offer the same excellent service but for your imported airfreight goods. For the more urgent consignments, we can utilise our network of overseas agents to help us make sure your cargo is here on time. With up-to-date cargo tracking, hubs at all major UK airports and deferment facilities available if required, we have everything taken care of. Please contact us for more information or a competitive quote.